Beautiful bedroom furniture set featuring a large double wardrobe, chest of drawers, dressing table set & pair of bedside tables. Offering excellent clothing storage for the bedroom for a vintage French style bedroom. The Adelise epitomises stunning French country style with shabby chic charm. The set featrues a large double wardrobe with hanging rail & drawer storage, large chest of drawers, pair of bedside chests with a stunning dressing table, large tabletop mirror and cushioned stool. The furniture is decorated with ornate carved features and ornate brass drop handles. 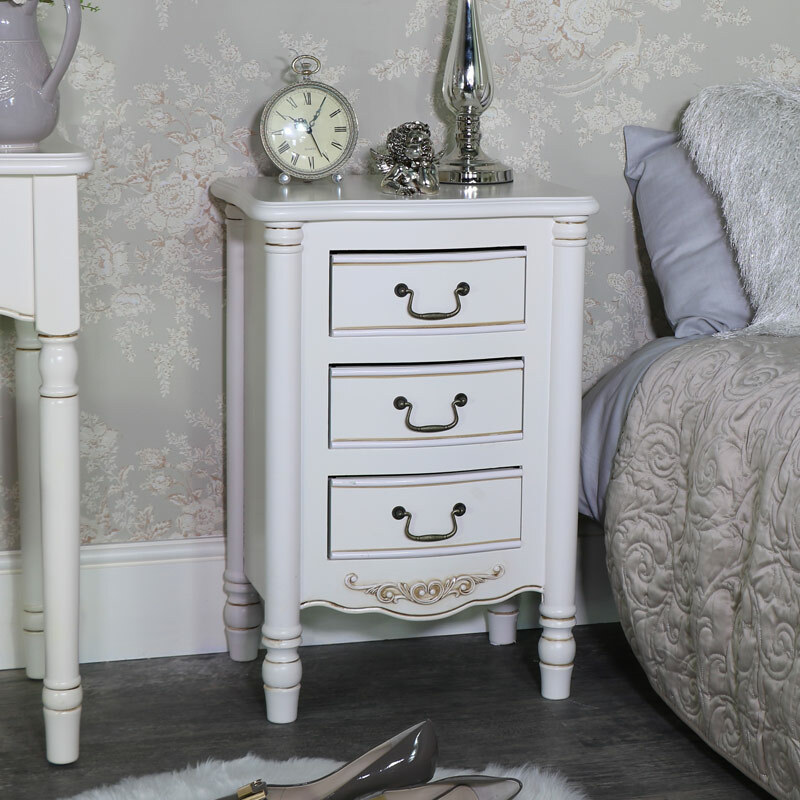 The large chest of drawers come with 4 drawers in a 2 over 2 style that will make up for what your wardrobe can’t hold or give you the perfect excuse to go shopping for more clothes! The pair of bedsides is just what you need for sitting at your bedside, with 3 drawers proving ample storage for holding your books, knick-knacks, phone chargers and accessories. Also offers a great place to sit a bedside lamp. Beautiful bedroom furniture set featuring a large double wardrobe, chest of drawers, dressing table set & pair of bedside tables. Offering excellent clothing storage for the bedroom for a vintage French style bedroom. 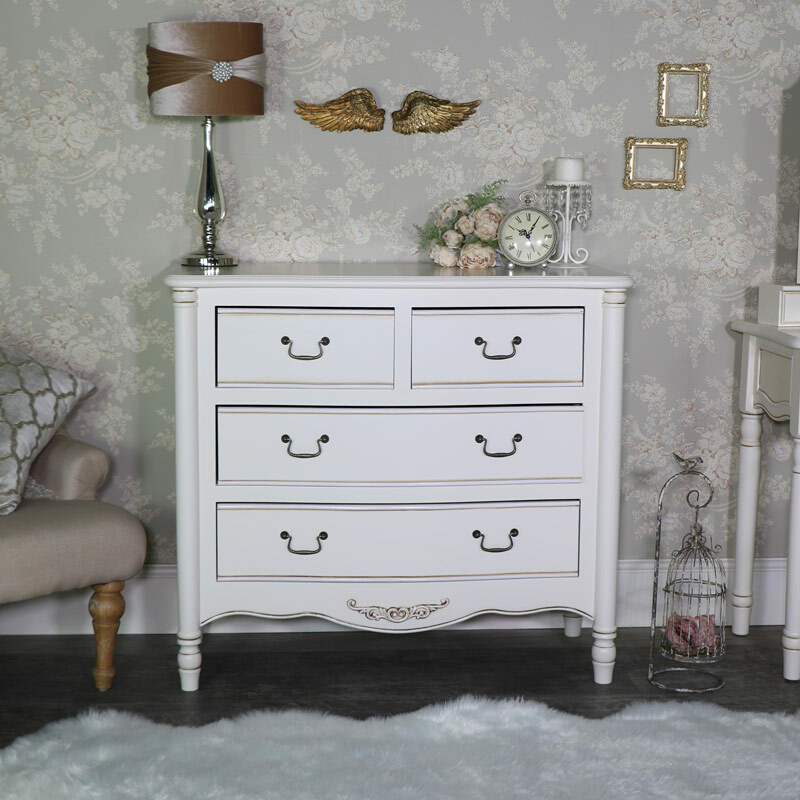 The Adelise epitomises stunning French country style with shabby chic charm. 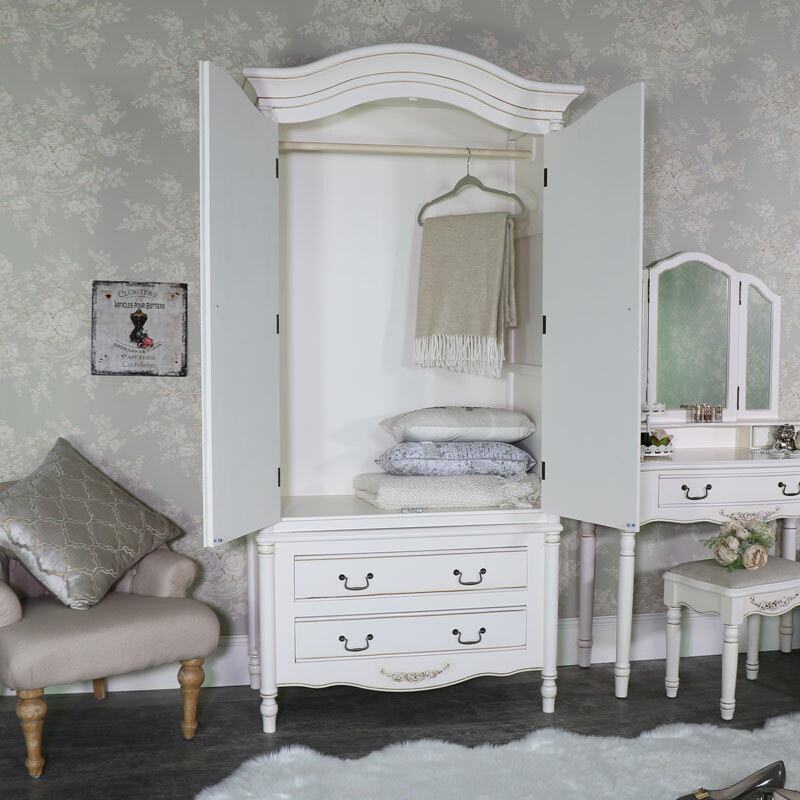 The set featrues a large double wardrobe with hanging rail & drawer storage, large chest of drawers, pair of bedside chests with a stunning dressing table, large tabletop mirror and cushioned stool. The furniture is decorated with ornate carved features and ornate brass drop handles. 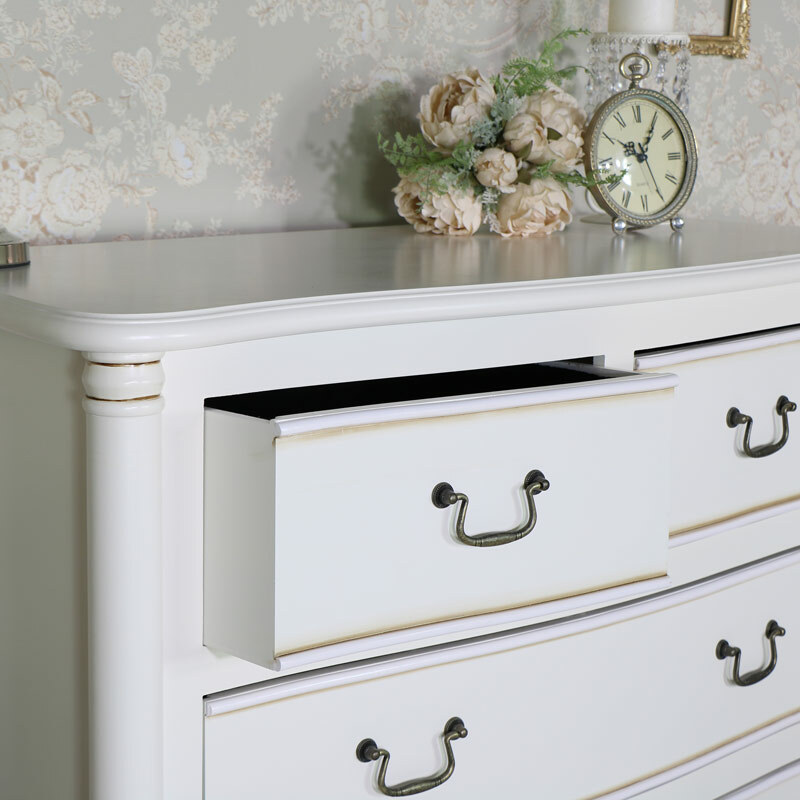 The large chest of drawers come with 4 drawers in a 2 over 2 style that will make up for what your wardrobe can’t hold or give you the perfect excuse to go shopping for more clothes! The pair of bedsides is just what you need for sitting at your bedside, with 3 drawers proving ample storage for holding your books, knick-knacks, phone chargers and accessories. Also offers a great place to sit a bedside lamp. 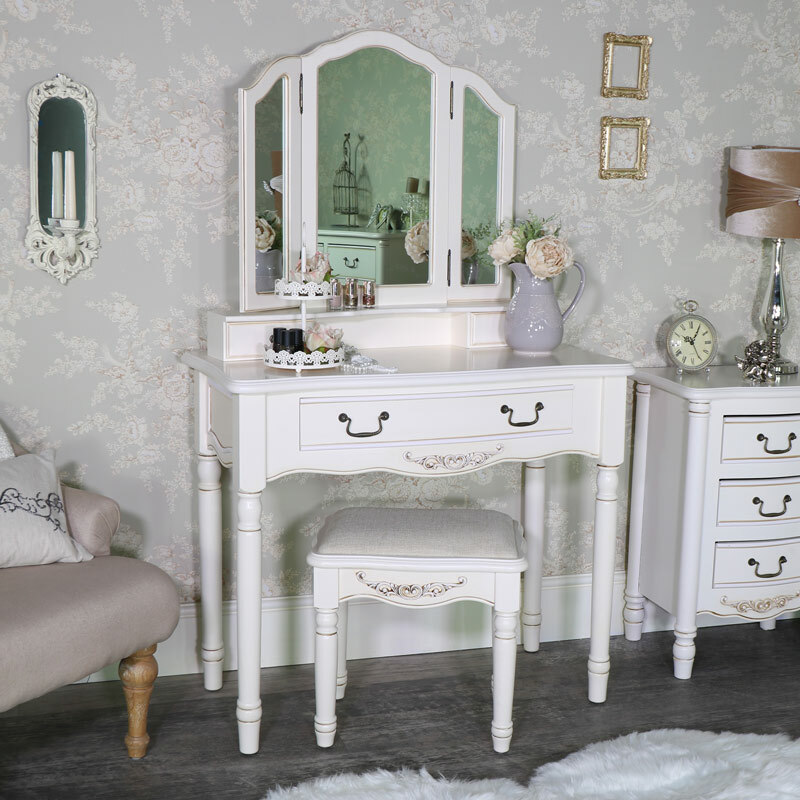 The dressing table provides that finishing touch to your décor with a large single drawer for all your hair and makeup accessories and extra storage on the mirror base with 2 small trinket drawers. The dressing table mirror itself is quite large, in a triple style, just right for seeing every angle. The comfy cushioned stool is just what you need for sitting comfortably whilst you do your hair and makeup, in preparation for the day or night ahead.